For my birthday, I got a beautiful hand tattoo which, is in and of itself, a major accomplishment for someone who has severe cerebral palsy, with the phrase, “No mud, no lotus.” I really wanted it on my hand in order to always be able to see it and take comfort in it. This tattoo is especially meaningful to me after everything I’ve been through. There has been so much darkness and pain, and yet, I am growing and fighting my way to the light out of the mud. This phrase was part of a recent meditation session and it really hit me hard because that’s how I feel. I am growing and changing; doing my best to become a better person while acknowledging that I am far from perfect. I’m learning to love myself and get away from toxic relationships even when it hurts. I’m trying to be like Christ without all the religious stuff. Without the mud (darkness and pain), there’s no beautiful lotus. I’m trying to get to the blooming flower and I AM getting there. There’s always going to be be pain and darkness throughout life, but it can always eventually turn into something beautiful! My beautiful hand tattoo by Candace Lyon. Since today is mental health awareness day, this morning’s meditation session was wonderful! I still struggle with anxiety and PTSD. This week has been especially rough for my bathroom anxiety. It’s sad that physical pain is widely acknowledged and supported, but when it comes to mental health issues, there’s still a stigma which can, and often does, make people feel isolated and alone. Nobody expects you to “get over” physical illness or pain, but they certainly expect you to hurry up and “get over” emotional pain. I truly believe emotional health begins at birth or even before. Children are able to pick up on our vibes. Therefore, they definitely require responsive, respectful care to be able to have a better chance at emotional health. After all, emotional health is just as crucial for a healthy society as physical health is. Note: This was originally written on November 22, 2016. I always have my husband edit my posts. God is good! So many Christians believe that He punishes us when we sin. He definitely corrects us which isn’t pleasant, but He doesn’t spank, hurt, or smite us down or I really shouldn’t be here as I have been really sinning in my anger lately. Today is an example of God’s love. We went grocery shopping today and got stuff for Thanksgiving. With everything we’ve been going through with grief, our cat being in the beginning stages of kidney disease, and other stresses, my husband asked me this morning if he could just make turkey and his mom’s amazing oyster dressing, and mashed potatoes because he just wasn’t into making the whole feast with sweet potatoes and green bean casserole. Of course, I said that was fine because we’re both at our limits. Maybe Christmas we’ll have the whole feast. We’ll see. So we get everything at the store and come to the van. My husband puts me in the van and I started freaking out. I cussed. My Sara ring, the ring he bought me on the first birthday without my beloved first kitty Sara, was GONE! I didn’t feel or hear it fall off. I was so upset and sick to my stomach. My husband looked ALL over. It was nowhere to be found. On the way home, I had a meltdown. I yelled at God. I said some very hateful things, and called Him names I’m ashamed of. My angry outburst was not as intense as the other night when I said some even more horrible things to God due to fear and anger about the possibility of losing our cat after having lost my mother-in-law and my grandpa all in the same year, but still, it was very nasty and I felt Him being sad. But I was so angry that I didn’t care at the moment. I got defiant and said that I would just go buy a new ring. I just really let Him have it. When we got home, my husband looked again for the ring. Gone. I felt sick. I couldn’t cry. I just felt sick. He called the store to let them know that I had lost my ring. But I had no hope. It’s gone. After putting stuff away, he takes me to the bathroom. As he was getting me up, I saw the ring in my underwear. I couldn’t verbally get it out that my ring was in my underwear due to having to focus on standing and holding on to my husband. It fell out and I said, “my ring, my ring!” He thought I was talking about another ring. So he gets me back in my wheelchair where he can understand me easier and I told him that it was my Sara ring. It was in my underwear and fell by my “potty chair.” He went in the bathroom, and sure enough, there was my Sara ring! We both thanked Jesus! Then I got on my iPad and checked my messages and my tattoo artist asked if I wanted to get tattooed next week. She broke her ankle right before my appointment in October to get my memorial tattoo for my mother-in-law and couldn’t do it, so I have been waiting and praying for her. I was concerned that she might not be up to it until after Christmas. I had gotten my first tattoo in honor of my grandpa the day after my birthday, and I wanted both tattoos before the holidays to keep my grandpa and mother-in-law close to me as the holidays will be tough again this year. See here to read all about my first tattoo. I was going to ask next week to see what she thought, but I will be getting tattooed on Tuesday!! Yay! Thank You, Jesus. Finally, I received a message from Safe Families, a local Christian organization that helps children and their families during crisis situations, and they said that want to see if they can figure out how to partner with me for parent coaching. Thank You, Jesus! After being so awful to Him again, He blesses me and let’s us know that He is here! He forgives. And maybe He disciplines us in a manner that truly humbles us through blessing because I didn’t deserve any blessings at all! And perhaps, we should be mindful of the way He disciplines and forgives us as we discipline our children. He definitely loves us no matter what and fathers us gently! Just re-reading this brings me to tears. I don’t deserve His love. God Came To Earth As A Human Baby! As Christmas draws near, I always enjoy thinking about how God chose to come to Earth as Baby Jesus. God coming down as a BABY and doing what all human babies do really says a lot about how He truly feels about children. He could’ve come as a man, but He chose to be a BABY. Our Almighty God was born the same way as all babies are, and nursed from His mother’s breasts! He was like all children. I believe Jesus cried as a baby and screamed as a toddler because these are developmental behaviors. Acting one’s age is not sinful when one is a young child. Jesus was 100% human as well as 100% God. He had to communicate His needs the same way all babies and children must. Of course, Jesus was sinless, so when He became an adolescent Who could act maliciously, He didn’t. Yet, God, the Father, didn’t send Jesus out to the desert to be tempted by satan until He was an adult. Whatever you believe about the “sinful nature” of children, this tells me that God, the Father, knew that Jesus’s brain needed to mature in growth and The Word before He could withstand the evil one. 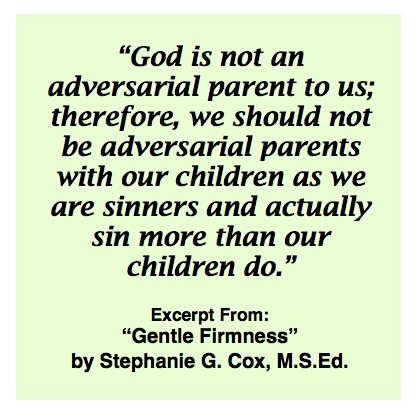 Much of what most Christians deem “sinful” in children is simply immature brains that cannot control impulses. It is not sin until the child truly grasps sin. How dare we call children “sinful” when God, the Father, waited for His Son to fully mature before sending Him into the desert. I find this all truly amazing! I think we, as Christians/Christ-followers, really need to reflect more on things such as this as it gives us greater insight into the true character of God, Jesus, and the Holy Spirit. It would make no sense if He really wanted us to leave infants to cry-it-out and/or to spank/hit our children! After all, He was a Child! “Behold, I was brought forth in iniquity, And in sin my mother conceived me” (Psalm 51:5, NASB). Even many Bible versions inaccurately translate this verse to say that David was “sinful” from birth. What I believe the verse is actually saying is that David’s mother was sinning when he was conceived. Other verses seem to contradict the church doctrine of infants being born “sinful.” Let’s look at some. “Therefore, to one who knows the right thing to do and does not do it, to him it is sin” ( James 4:17, NASB). “Moreover, your little ones who you said would become a prey, and your sons, who this day have no knowledge of good or evil, shall enter there, and I will give it to them and they shall possess it” (Deuteronomy 1:39, NASB). “For sin indeed was in the world before the law was given, but sin is not counted where there is no law” (Romans 5:13, ESV). “But Jesus said, ‘Let the children alone, and do not hinder them from coming to Me; for the kingdom of heaven belongs to such as these'” (Matthew 19:14, NASB). As we can see, infants and young children are not ever considered “sinful” in the Bible. We will all eventually sin in our lives and will need Jesus to save us from our sins, but infants do not even know what sin is, therefore, they cannot understand what sin is. They re so young and are totally in the present moment. They cannot plan ahead. Also, if we truly observe infants in an objective manner, we’ll see that they are eager to interact with us. And as soon as they can physically do it, they will offer toys and food to us. It may be slobbery, but they love to share with us and interact with us. No infants are ever “sinful.” Infants are totally innocent. It is very important for us to understand that infants’ wants are also their needs. Infants are incapable of manipulating us during their first year of life. Yes, as they get older, they can wait a bit for a need to be met as long as we tell them we will meet it soon and follow through. But even wanting to be held is an actual need for infants. Let’s do our best to treat infants in a manner that will allow them to keep their innocence for as long as possible instead of treating them harshly, making them learn to be selfish. 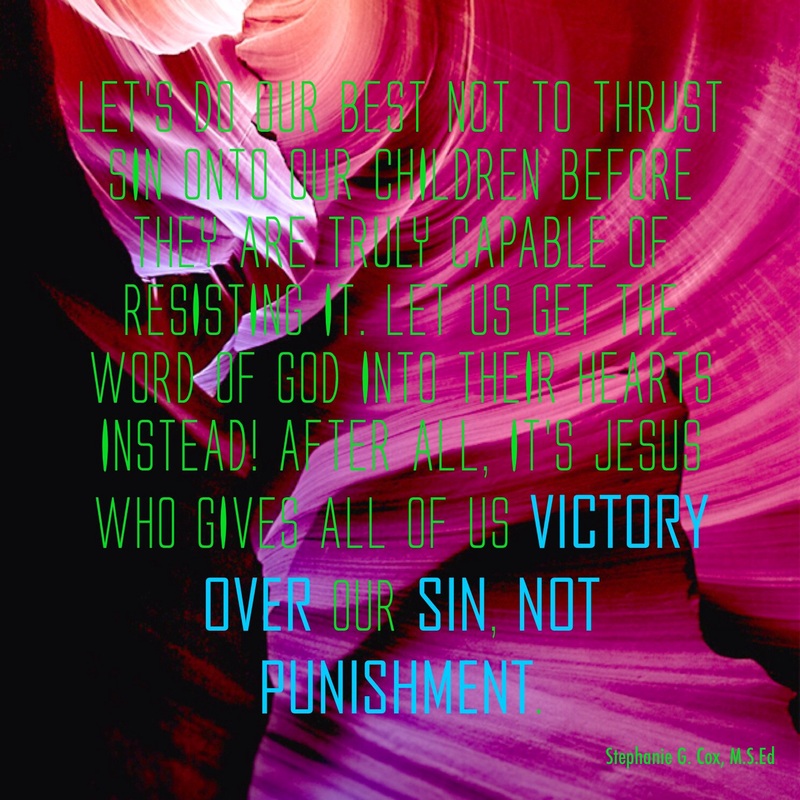 This passage shows God wants to break the yoke of oppression which He did through Jesus. In fact, Jesus said, “For My yoke is easy and My burden is light” (Matthew11:30, NASB). Yet, many Christians do the exact opposite of what Isaiah 58:6-10 tells us to do. Christians point their fingers at others, especially children. Christians put the yoke of oppression on others, especially children. And Christians judge! I have been guilty of pointing fingers and judging myself. I am far from perfect. 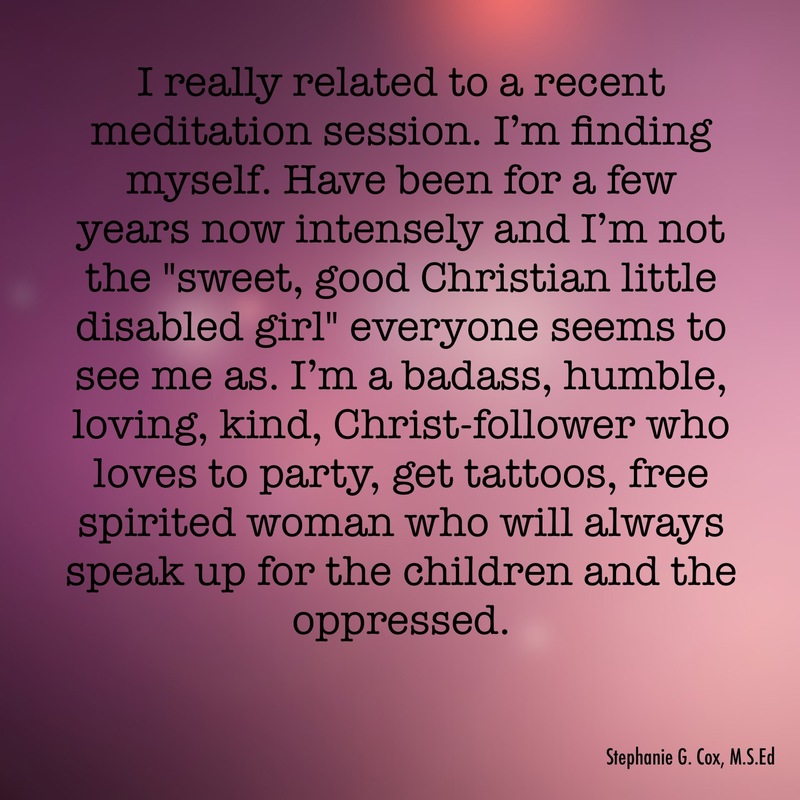 Of course, before I get into how we do this with children, I need to comment about the most recent ways Christians are pointing fingers, placing the yoke of oppression onto others, and are judging. This week the U.S. Supreme Court ruled that gay marriage should be allowed in every state. This has Facebook going nuts. Many Christians are angry. People are arguing. Memes are going around. And many profile pictures have rainbows on them. I’ve stayed out of it for the most part except for commenting on a few friends’ posts. I believe the act of engaging in homosexual acts is a sin according to the Bible. I believe that marriage is between a man and a woman as even Jesus reiterated in Matthew 19:4-6. Marriage is a symbol of the covenant between God and the Church, therefore, it is Holy Matrimony. That being said, this is not a Christian nation. I’m not sure if it was ever really founded on Christian principles. What this country was founded on is freedom. That includes freedom of religion. I am free to follow Jesus and worship Him openly. There is a reason for the separation of church and state. The government has no business telling us what religion or deity to follow. Allowing gays to marry is simply giving them freedom. Do I agree with that lifestyle? No. Is it my job to push my Biblical belief onto them? No. I am not condoning the lifestyle of homosexuality. But, God gives us free will. They are free to live how they want. They’ll never enter into Holy Matrimony, but since this is a free country and as long as they’re not hurting anyone but themselves, I believe they should have equal rights. If we want them to come to Jesus, we need to love them as Jesus does. We are all sinners. Stop judging, pointing fingers, and placing the yoke of oppression on them and just give them grace and love. They already know we disagree. Instead of making this such a huge deal, why not quietly show them love by remaining peaceful? It doesn’t mean we condone it. It just means we be Jesus to them. Now, when it comes to children, many Christians also put the yoke of oppression on them, point their fingers at them, and judge them. The primary way we put the yoke of oppression on children is putting unrealistic, unattainable expectations on them. Expecting infants to sleep through the night is unrealistic and unattainable. Expecting toddlers to control their impulses and emotions is unattainable and unrealistic. Expecting children to cheerfully obey the first time is also unattainable and unrealistic. 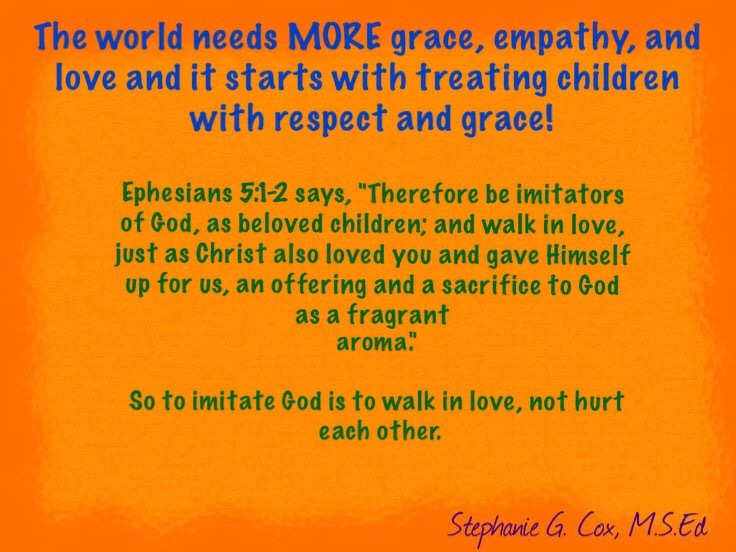 Christians who have unrealistic, developmentally inappropriate expectations of children oppress them because they do not allow them to be children. They force children to be someone they’re not. Children are not free. Then when children don’t live up to the unrealistic expectations, they get fingers pointing at them saying how “bratty, sinful, defiant, rotten, spoiled, and horrible” they are. I can’t tell you how many times I’ve seen this happen to children who were just being children. Of course, many parents point their finger at their children while rebuking them. Yet, the opening passage tells us to stop pointing our fingers at each other. This applies to children too. Finally, many Christians judge children. They can’t negatively label children without judging them. And with judgment comes punishment by either ignoring an infant’s cries so they “learn to sleep,” which the only thing infants learn through cry-it-out is that we won’t come. They still wake up hungry, scared, in pain, sick, hot, cold, wet, poopy but they won’t cry out because they’ve learned nobody will come. This is not what God wanted. And they don’t enter a natural sleep when left to cry-it-out. Infants’ bodies shut down from all of the stress of crying and they enter a forced state of sleep. As far as judging children and really, anyone, Jesus says not to do it. When we decide that a child deserves punishment for “defiant” behavior, we are judging the child. Instead of judging and meting out what we think is “proper punishment,” we must connect with and discipline the child. Let us stop, as Christians, doing the very things God is trying to undo. Stop placing the yoke of oppression on others. Let us stop pointing our fingers at others. And let us stop judging each other. May we love one another as the Bible says over and over again.